Chicken can be substituted for beef, and thinly sliced green cabbage can also be added to the mix. 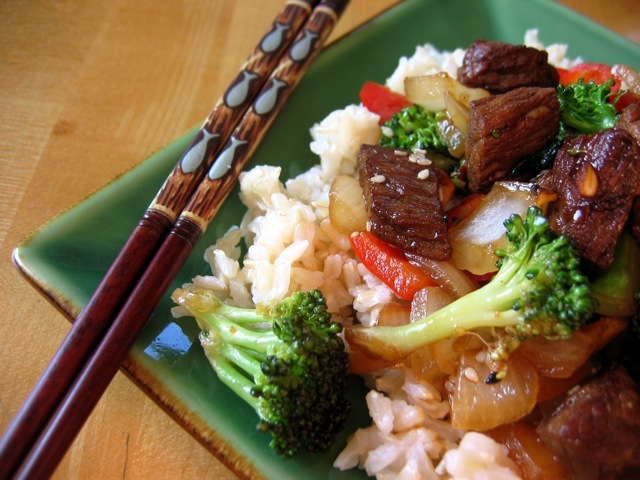 For a complete meal, serve the stir-fry with brown rice and a bowl of tangerines. In a small flat-bottomed dish, mix together the soy sauce with the sesame oil, garlic, brown sugar, and crushed red pepper. Add the beef strips, mix together, then cover and let marinate at room temperature while you prepare the other ingredients. Once the vegetables are prepped, heat a wok or large skillet until hot but not smoking. Add half of the vegetable oil, then the ginger, and stir-fry over medium-high heat until it begins to brown. Next add the beef, reserving the marinade, and stir-fry 1 or 2 minutes until the meat is just browned. Remove the beef to a plate. Return the wok or skillet to high heat and add the remaining vegetable oil. Add the onion, broccoli, and red pepper (and cabbage if using), and stir-fry a few minutes, then turn down the heat and carefully add the reserved marinade. Cover and cook, stirring occasionally, for about 5 minutes or until the vegetables are crisp-tender. Return the beef to the wok/skillet and stir-fry over medium-high heat until heated through. Season to taste with salt.